As I collect my minis and pile up an absurdly large painting queue, I got to thinking about guns and cannon. As you do. I have several of the Black Hat guns, and they are lovely, but the hover sled idea doesn't really do it for me. I can't see liftwood in My Mars being used in this way. It's pricey stuff, it wears out over time, and just think of the recoil - it may negate gravity, but inertia's a killer! 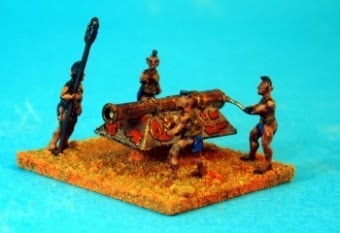 So I had resigned myself to using the crew with some Old Glory SYW Ottoman cannon (in 3 sizes) I had lying around. As you do. So there I was, reading the latest post on the Warlords of Mars blog here, and revelation struck me. He mentions "heavy guns" and "Martian artillery stationed in the Keep and the gun towers" and I realised that the models really are of quite large guns, and that my Martian guns might be placed into fixed positions. The grav sled was suddenly converted in my mind to the return carriage of a fortress gin. Simple! All I would have to do is build the recoil carriage and a way of traversing the gun ... something along the lines of the is 10" Columbiad from Freikorps, but make it more Martian. As you do. Nice concept. But what was I going to use? It took a couple of days to collect ideas, but in the end the materials were surprisingly easy to amass. Oh, and the Martian gun of course. First I marked out the approximate dimensions of the assembly on the base, drawing a cone (actually the segment of a circle) with a 2cm diameter for my purposes. The degree of traverse is limited, but I'm only looking to make an impression here rather than a fully functioning model. Then I cut the matchsticks to length (30mm) and inserted the offcuts as spacers to add some width and stability. The two round bases were glued together to create the impression of a rotating drum. This will also add some height, and also allow the gun to fire over a 1/2 inch parapet. 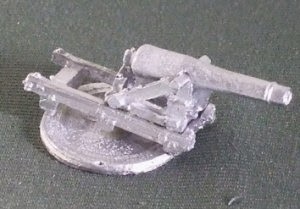 The depth of the base, the two disks, the matchsticks and the height of the gun model itself come to about 14mm below the barrel. You may prefer to have the gun nearer to the ground, but this arrangement works for me. I cut a segment out of the coke bottle top. This was to represent a runner to support the rear of the gun while it traverses. I cut it slightly taller than the height of the drum to allow the rails to angle down towards the front, and sanded the edges smooth before glueing it over the end of the cone. The curve isn't a perfect fit, but it will look fine from a distance! Then I drilled a guide hole through the centre of the rotating drum and at the apex of the cone, and then threaded a piece of wire through both to help position the drum in the right spot. The matchstick "rails" were then glued to the underside of the gun sled. Then I glued the gun sled and rails to the base assembly. Once dry I also used the guide hole for the drum to drill and pin the sled to the rest of the assembly. just to give it a bit more solidity. Add the barrel, and hey presto; one fortress gun! Not the clearest of photos, but it should look good behind a wall. I'll still use the Ottoman wheeled carriages for my field artillery, but I am truly glad to have found a use for the Black Hat guns. Thank you Warlord Mike for the inspiration!